I’ve had this silver filling for years, why do I need to replace it if I’m not in pain? We’ve heard this question many times at our practice and it’s a valid concern that deserves a more in-depth answer. We hope the information below helps you better understand why our providers sometimes suggest seemingly good fillings be replaced when pain isn’t present. The need to replace old silver fillings really depends on multiple factors. How pro-active do you want to be? Some people are more re-active when it comes to their dental health, waiting until there is pain or discomfort to address a problem. Unfortunately this method usually means a more costly procedure will need to be done like a root canal or crown. While others take a more pro-active approach and don’t want to get to the point of feeling pain. They would rather have a filling replaced right away to have the peace of mind. When these problems are corrected early, it saves you money and keeps you out of pain. At DBD we practice pro-active dentistry; we would prefer to see our patients replace old silver fillings once we’ve diagnosed that there is a problem rather than wait until pain arrives. We understand that not everyone feels the way we do, but we have an obligation as your dental provider to identify any dental related problems and suggest the best way to correct them. We would be doing you a disservice if we did not bring these issues to light right away. Whether or not you choose to go forward with our proposed treatment is ultimately up to you. Do you have cracks in your filled tooth? The metal used in amalgam fillings corrodes over time causing it to expand and contract, and over the years this can cause fractures in the tooth. A fractured tooth allows food debris, saliva and bacteria to get in and cause a cavity in a filled tooth. Is there a cavity under your silver filling? Cavities can hide under fillings and usually can go undetected because they are opaque to x-rays. At DBD we use x-rays to help diagnose the condition of the tooth, but we also use an intra-oral camera that helps us get a better picture of what exactly is going on inside. Just because a tooth is filled it doesn’t mean it is cavity free. Is your filling leaking? 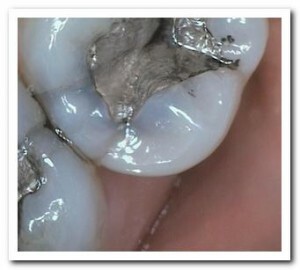 As amalgam fillings breakdown, they begin to pull away from the tooth. When there is no seal, per se, that is when fillings begin to ‘leak’. This is a problem on many levels. First this allows food, saliva, and bacteria to enter your tooth which can cause damage to the tooth in the form of decay. It also causes less strength in the tooth and may make it more susceptible to fracturing. Do you clench or grind your teeth? Normal chewing puts a substantial amount of force on teeth naturally and over time can wear down your fillings. If you clench or grind your teeth this causes even more excessive force which cause fillings to breakdown faster. Do you chew on hard objects? Some people like to chew on hard candy, ice, or objects like pen caps. These practices can also impact filled teeth by putting more pressure on the tooth and filling than would normally occur. As you can see there are many things that play a role in needing to replace old silver fillings. It’s important to note that we won’t remove fillings just for the sake of replacing them, but as they get worn out and compromise the health of your tooth we will suggest replacing them with composite restorations. The composite material adheres to your tooth more effectively than the amalgam fillings. The best form of defense to these types of problems is keeping regularly scheduled dental check-ups. It is at these appointments that we can detect cracks, leaks, and cavities in filled teeth and treat the problem pro-actively.